👈 Click here to subscribe to our Youtube channel ! Hey guys we are back with another video. 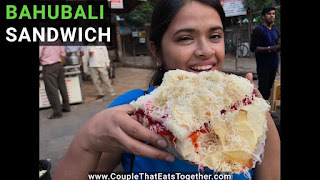 This time we are trying out the BIGGEST SANDWICH in Mumbai "BAHUBALI SANDWICH". This is one of the special sandwiches created by Mr. Bhavesh Mistry is total roller coaster ride of flavours. This is made up of massive three layers with loads of cheese. Food adventure lovers don't miss it. Near Gokul Hotel, Pai Nagar Gate, SVP Road, Borivali West. #PlasticBan in Maharashtra : How to Dispose Garbage ?